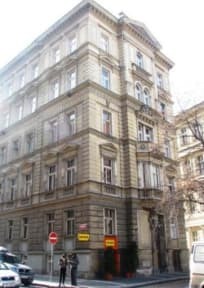 Chili Hostel, Praga, Czechy : Rezerwuj teraz! Written cancellation is possible up to 2pm, 7 days prior arrival. In case of no-show we have to charge the full amount of the firsts night booking. Breakfast can be ordered at arrival. In case any specific group splitting is necessary an email with the exaxt data is sent to info@chili.dj 7 days prior arrival. Enjoy the beautiful view of the stunning Prague architecture along the Vltava and all the major sightseeing attractions of Prague are in walking distance including the National Theatre, Charles Bridge or Old Town & Wenceslas Square. 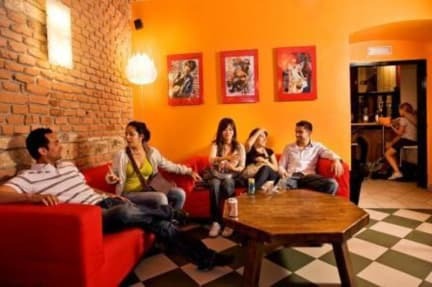 Chili hostel provides accommodation for individual backpackers, schools, groups, couples or families. Our hostel offers a different selection of different mixed dormitories and private rooms hosted in a modernized old building of the 19th century. We have created our dorms for your convenience to experience a valuable time in Prague. Next to the normal features our dorms/windows are equipped with black-outs allowing you to rest at any time of the day either after a long cultural sightseeing tour in Prague or a long night out. On the ground floor you will find our PCs with free internet and fully equipped kitchen (Tesco just around the corner). Security is important to us and therefore we have additional lockers at the reception and a safe in our office. Please feel free to use them at any time. Furthermore we have restricted the access to our house, letting only those in who belong here. A new set of linen/bed sheets and towel will be provided extending the stay over 5 days. PLEASE NOTE: We need to pre-authorise your credit card before arrival in order to guarantee your booking, if we cannot process the pre-authorisation we may be forced to cancel your booking. Check-out/Check-in: 11am/2pm. Late-Check out on request. Please note that we charge a fee when checking out after 11am without any information to the reception. Hostel CHILI accepts cash and cards Visa, Maestro, MasterCard, AmEx, Dinners Club. Please note that the currency of Czech Republic is CZK. The hostel is not able to accept cash payments in Euro for all services hostel is offering. If you prefer to pay in Euro please use a bureau of exchange at the reception. Rates are available at the reception. Prepayment by bank transfer is possible. City tax (15czk) is excluded of the price and is put on top of the bill. A security deposit of CZK 200 is required upon arrival for keys when staying in dormitory rooms, CZK 500 will be required in all other room types. This deposit is fully refundable upon check-out and subject to a damage inspection of the accommodation. Our 24/7 multilingual reception is always happy to assist you with sightseeing tours, pub crawls and further information. Our information board holds many information for you to explore Prague and its neighborhood including all the secret spots of Prague. At the reception you can also buy drinks, beer, different tickets to different events like pup crawls (VIP tickets), Czech beer tasting tour or other events. Parking is only permitted with permission in Prague 1. The nearest Parking Space is the National Theatre which incurs a daily charge. Parking at Karlovo Namesti which is 2 min nearby is possible for free at Saturday and Sunday. We are looking forward to seeing you in our place and have a safe trip to wherever your paths my lead you. Dla mnie bomba. Centrum miasta, woda w kranie, przyzwoita cena. w pokojach czystość ok, ale jeśli chodzi o łazienki to kiepsko. Jedno z łóżek w naszym pokoju było tak jakby zarwane i nie dało się na nim spać. kuchnia jest, ale rzeczy raczej średnio nadające się do korzystania. jeśli mogłabym wybrać jeszcze raz to raczej zmieniłabym na inny. Na szczęście byliśmy tylko jedną noc. Skrzypiace łózka, kazdy obrot na lozku budzi caly pokoj. Brak przescieradla, jedynie poszewka. I'm sorry, but some insects were in the room in large quantities.